The Turrill Sculpture Garden which shows changing exhibitions of sculpture throughout the year, opens to sculptors from around the county for the three weeks of Artweeks. Anne Arlidge, Lucy Kinsella, Briony Lawson, Marie Shepherd and Rachel Woods team up to bring their huge skill and talent to create beautiful sculpture that could light up your own garden and add to your creation. They work on a scale that fits perfectly into the English garden and there is always a spot that turns into a new focal point when sculpture is set there. 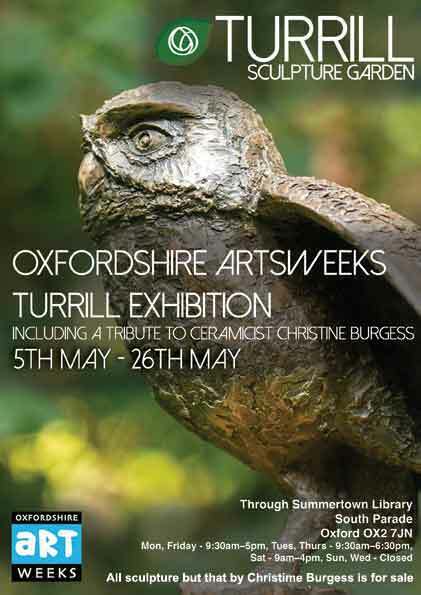 We will also be displaying a collection of ceramic sculpture by Christine Burgess, who died recently, as a tribute to a talented sculptor and good friend and supporter of the Turrill Garden.